We know that many of you work closely with Guided e-Learning to deliver excellent learning online resources to your students. ElsieApp has partnered with GEL so that it’s now possible for new and existing GEL customers to automate their student registrations directly from ElsieApp - ensuring your students GEL accounts will be all set up ready for when they start learning with you...and even before if necessary. in order to automate to support new and existing GEL users it’s now possible. If you’re a member of English UK then you will already know about the compulsory annual data that all members are required to submit and you may also know about the optional quarterly statistics scheme called QUIC. The Quarterly Intelligence Cohort (QUIC) is open to all English UK members on an annual rolling basis - Participants submit detailed student data and in turn benefit from comprehensive, robust and timely statistical reports produced by Bonard (formerly StudentMarketing). The reports represent a true picture of the UK ELT sector - one that is valuable to all English UK member centres, whether a seasonal junior provider, FE college or HE institution. Checking and tracking the validity of all your accommodation gas certificates and fire risk assessments can be very time consuming. 1. Go to the "Accom." Menu, then "Mailing"
2. Select hosts with "Gas Cert. due in upcoming month"
A lack of motivation, distractions and struggling with studies can all affect student attendance and it can be difficult to spot behaviour change before it’s too late. With student numbers increasing in the summer you need to be able to quickly identify those students who need a little help. Elsieapp allows you to closely monitor each student’s attendance and notifies you of students with an attendance rate below 90%. The notification message also shows you the student’s attendance during the three previous weeks, to add context. Instead of spending time calculating student attendance rates, let Elsieapp do the maths and inform you which students are not showing up to class. No one wants to scare students with safety issues (and after all the UK is largely a very safe place to live) but at the same time, it’s important to address the issues of personal safety and greater awareness of the potential dangers. Be aware - Walking the streets at any time is more hazardous when wearing headphones - whether playing games or listening to music. Encourage your students to take them out and be aware of the people and traffic around them. Be informed - We’re all aware of small pockets in our neighbourhoods which are perceived to be less safe than others. Tell your students about these places and safe routes to take to avoid them. Alcohol - Many young people gravitate towards alcohol in their teens (the legal drinking age, of 18 in the UK, may vary from their home country). Make them aware that they must know their limits and that everyone is more vulnerable when under the influence. Public transport - If students find themselves alone at night advise them to try to sit by the driver on a quiet bus and only ever take registered taxis. Keep possessions hidden - walking around alone with a new mobile phone in hand, or sitting in the open with an expensive laptop, can attract unwanted attention. If alone keep your valuables covered up and inconspicuous. Plan ahead - Ensure your students always tell someone where they’re going and what time they’re expected. Caring for friends - If out in a group of an evening remind your students to look out for the other members of the group - and they will look out for them. In the event that a bag or purse is lost encourage your students to keep an emergency phone card or £1 in their pocket so they can call for help. 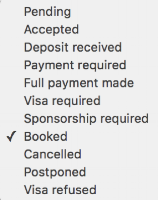 When handling bookings it's crucial to know the stage of each of them. To assist your enrolment team a detailed list of booking statuses is readily available. This list will prove invaluable when analysing upcoming bookings with a similar status and will allow the enrolment team to process bookings in bulk. The list will also help the academic team to know how many bookings are confirmed and how many more to expect. Do you want to save time at work? Our days are filled with repetitive patterns and tasks that can be automated, help us to identify them so you gain efficiency at work.